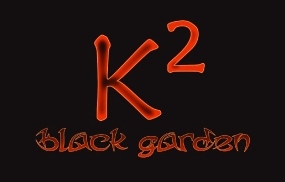 Welcome to the new K² website! Here you can order our merchandise, including our new DVD. This latest release features K² in Holland in 2012 at The iO Pages Festival. This website will be constantly expanding, so check back often as we be adding all kinds of intresting, Proggy thingys! What happened next was completely unexpected. Over the next 4 years,fellow musicians Allan Holdsworth, Ryo Okumoto, Shaun Guerin, Yvette Devereaux & John Miner added layer upon layer of unique, signature sounds that resulted in K2's first album "Book of the Dead". Critically acclaimed around the world, K2 went on to perform BOTD live with a new line-up consisting of Ken and Doug, Ryo Okumoto (keyboards), Karl Johnson (guitar), and Josh Gleason (vocals). In 2006, K2 filmed their first gig, which was released on their 2008 concert DVD, ?K2 Live in Hollywood". In 2007, this lineup went back to the drawing board to create what would become their long overdue 2nd release, "Black Garden". Released September 21st, 2010 on Magna Carta Records, this outing showcases this modern rock quintet in an entirely new setting. With a central theme of Oceania, K2 explores the hidden depths of this mysterious region and take the listener on a dark, sonic journey to places rarely visited, and offers a glimpse of a people unlike any other on earth. K2 then followed this release with a short east coast tour that saw the band gaining new fans and appreciation, with an amazing gig in Boston, that was the high point of the tour. After the tour, writing and recording of new material commenced with a couple of epics and some shorter songs working their way thru the band. During this time, there was a line-up change with vocalist Brent George and guitarist Steve Poloni coming on board. With this change it was decided to head back out on the road, this time to Europe! K2's 2012 European Tour was an amazing experience for the whole band, making new friends and adding more fans with each stop. Jumping over the "Pond" proved to be a resounding success for K2, playing all over England and ending in Holland. A new DVD of their concert filmed in Holland at The iO Pages Festival during the tour will be released September 25th, 2015. Also, K2 are currently finishing the recording of their untitled 3rd album. They hope for a Spring 2016 release and another tour to follow.